Last Friday marked ATZ’s first weekend away from Coney Island and first weekend off since Memorial Day! After winding up the season at the People’s Playground on September 13, we soon began to miss the noise and the crowds. We headed over to the closest carnival—the 82nd Annual Feast of San Gennaro. Strolling along Mulberry Street from Houston to Canal, we met quite a few Coney Islanders who’d brought their games, sideshows and food stands to Little Italy. In fact, the stand where we finally stopped for calamari because it looked the most appetizing turned out to be owned by the proprietors of Gyro Corner on Coney Island’s Boardwalk. 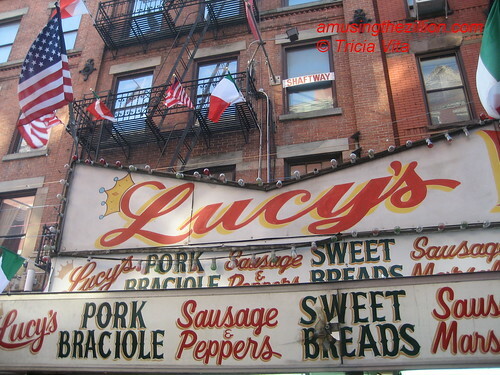 Different menu in Little Italy, thanks to Mama’s sauce. Lucy’s Palace is famous for their sausage sandwiches, but I was struck by the fabulous hand-painted marquee on their vintage trailer. A lot on Mulberry was filled with game concessionaires from Surf Ave and Dreamland and a trio of single-o’s direct from Coney Island. 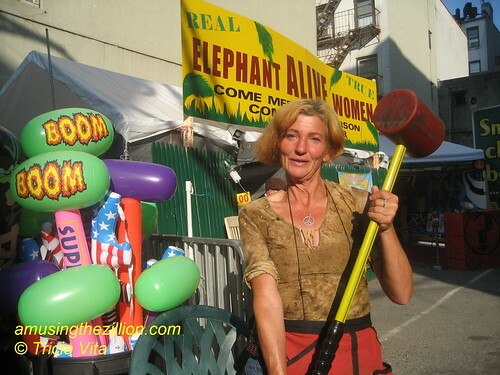 Kima “The Elephant Woman” made her sideshow debut this summer in Coney at John Strong’s Strangest Show on Earth. A ten-in-one sideshow with some former Coney freaks including Eak the Geek was there early in the week. 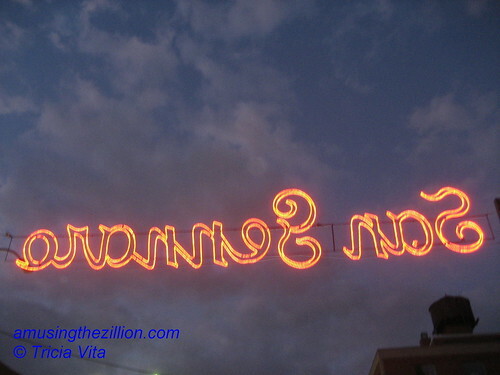 You just never know who or what will turn up at this 10 day extravaganza in the narrow streets of Little Italy. This is the place where Coney Island’s world famous Shoot the Freak got its start! 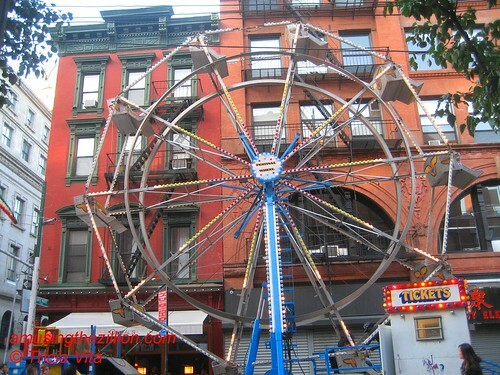 Toy Store Amusements’ Festival Wheel and three kiddie rides nudged up against the apartment buildings on Grand Street. 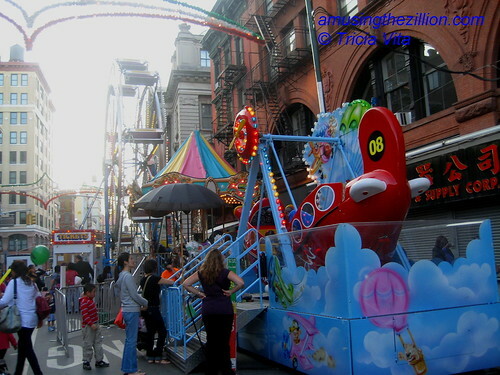 In the increasingly gentrified streets of New York City, amusement rides at street fairs are becoming a rare sight. As far as carnival games, water race fun and one ball in wins were it.. The iPod Touch was the most hyped prize. 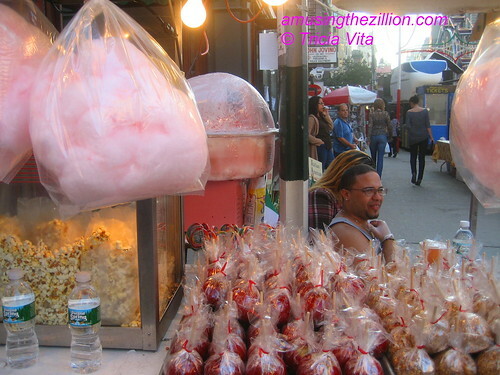 The complete Photo Album: Coney Islanders and Carnies at San Gennaro can be viewed on flickr. 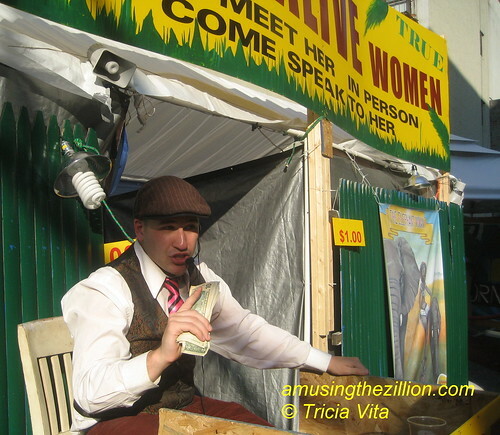 I had a great time seeing the Elephant Woman sideshow. It was a new show there. She was awesome.